Everyone’s life is a bit different. Selma figures out what kind of low-cost, ready-to-buy investment mix fits your financial situation. Open account in minutes, online. Invest for the years to come. + Products’ costs. That’s all. 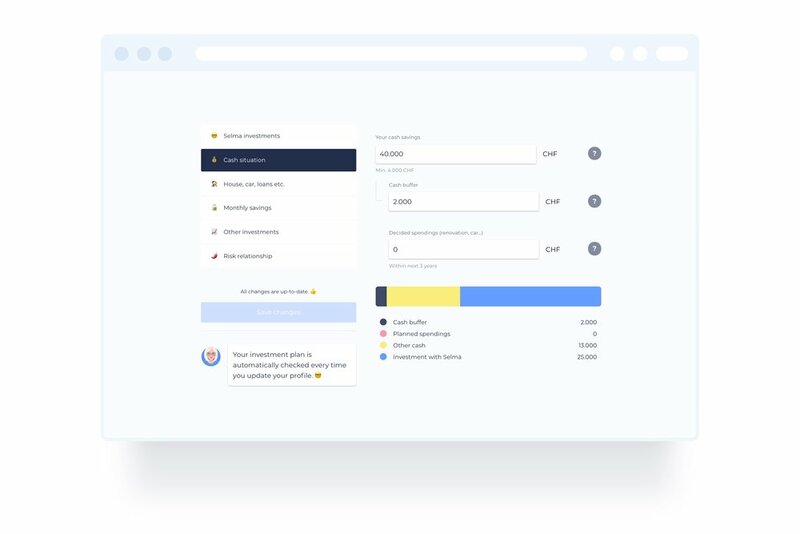 Start for free with "REDDIT5K"
Selma's fee and product fees for CHF 15'000 invested would be around CHF 11,50/month, in total. Ideally, 3-5+ years and up. If you ever need to stop or slow down, that's ok too. Selma is the first Swiss financial service that has been built together with the people like you. 700+ direct feedbacks, hundreds survey replies, dozens user tests, a contributor community and the open product roadmap. All to make Selma work for you – as it should. What really made a big difference, for me, was Selma's close contact with customers. As a little thank-you gift, all Redditors get 12 months of service fees waived for 5'000 CHF investment. That's 36 CHF. Just chat with me to start.